Reverse osmosis (RO) water purification systems from Ebtech deliver from 9 to 12 gallons of demineralized water daily. The home point-of-use systems are available in Cook and Cold or in Hot, Cook, and Cold models. The systems feature RO filtration technology and a modular design with additional customized filtration options provided by “snap-in” filter cartridges. Standard features include polycarbonate cabinetry. All components are UL and CSA listed and FDA approved. Both systems carry a limited five-year warranty. The Rolen Vu-Flow Venturi is available exclusively and as standard equipment on Ozone Pure Water systems for domestic and light commercial applications. Made of molded clear PVC, the venturi allows the ozone to be viewed as it goes into the water stream. One size fits all systems. Pre-engineered water treatment units for commercial, institutional and light industrial applications are available from the illcowater Products Group of Alcoa Separations Technology. The product line includes units for filtration, ion exchange softening and demineralization. A multi-function valve assembly provides hydraulic control that operates with no water hammer. The illcowater line is available in 10″-, 13″- and 16″-diameter units with top-mounted 1″ multi-function valves; and in 20″-, 24″-, 30″-, 36″-, 42″- and 48″-diameter models with face-mounted 3″ multi-function valves. The Sentry Flowmeter from Better Water Industries, designed specifically for well water applications, checks gpm flow rates, monitors pump conditions, finds water line restrictions, measures pressure switch accuracy and checks pressure tanks for water logs. 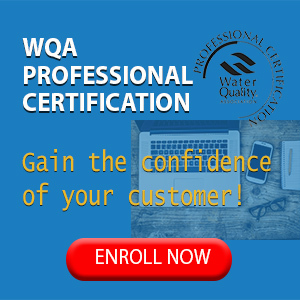 The WAT Water Filter from Water Air Technology International carries the Gold Seal from the WQA. The first open discharge system to have been awarded the Seal, the filter completed testing and validation under industry standard S-200-73 for product performance and capacity testing. The handcrafted Designer Ceramic Canisters for countertop filters from The Water Filter Co. are available in a variety of size, color, style, decal, patterns, finishes and filter types. Protective feet eliminate countertop scratching. The new analog and digital multiple range colorimeters from LaMotte Chemical feature an optical design to eliminate stray light error, an automatic shut-off after 30- second read period, precise narrow band pass filters and a solid state design. Filters are selected via enclosed switch-selectable filter assembly. MC 1600 analog analyzers features slide-in scales for direct reading in ppm. DC 1600 digital instruments read in % Transmittance with a conversion chart to ppm. Both analyzers meet EPA requirements for photometric apparatus and are supplied with six sample vials. The Crystal Creek water vending machine uses a combination of filters and RO to purify the water and then passes the processed water through a UV sterilizer before it is dispensed. Designed for supermarkets and convenience stores, the 28″ x 28″ size is an added benefit in stores with limited floor space. Introduction to Activated Carbon, a brochure from Barnebey & Sutcliffe, covers the manufacture and uses of activated carbon. The brochure details the basic raw materials for activated carbon, the primary porous carbons obtained from the sources, and the treatment of the carbons to obtain the extensive internal pore structure necessary to facilitate adsorption. The product can be seen at Booth 569 at the WQA Show in Long Beach. Strainers and laterals from Orthos are designed to insure uniform distribution of fluids in demineralization and filter systems while preventing the loss of bed minerals. Various types and sizes are avail-able in materials including polypropylene, glass fibre reinforced polypropylene, kynar, stainless steel and hastelloy. An expanding ring adaptor accessory allows the installation of a strainer in a pipe or false bottom without the need to tap the holes. Water SticksTM, a disposable water filter from Valnco, screws onto any kitchen faucet with an adapter ring eliminating other attachments. The three-stage filter is designed to control bad tastes and odors and will neutralize harmful chemicals and sediment from the water, states the manufacturer. The filter consists of a microscreening prefilter, activated carbon and KDF-55 to neutralize the water. Constructed of high-impact polycarbonate material with a built-in replacement indicator, each Water Stick is designed to last one to two months or 180 gallons depending on water conditions. Brushed-finish, corrosion-resistant stainless steel pressure vessels from Applied Membranes accommodate standard 1.8″ x 12″, 2″ x 13″ and 2″ x 26″ thin-film and CTA membrane elements. The vessels provide an operating pressure up to 250 psi to permit the maximum possible permeate flow from the membrane element. Provided with one-piece Delrin end-caps and stainless steel retaining rings for easy assembly, the vessels are available by themselves or with the membrane elements. The fully automatic, non-electric LP Series RO system from Water Factory Systems is designed for light duty commercial applications such as office drinking water systems, ice makers, coffee makers, humidifiers and laboratories. Production rates are 30 and 60 gpd in CTA and 40 and 80 gpd in thin film composite. The systems come with installation kits and pretreatment. In addition, a variety of pre-engineered storage and post treatment systems aid installation. The Quality Chemical Feeders from G. H. Stenner are available in sizes for use in chemical feeding and liquid metering applications. Capable of producing pressures up to 100psi, the electric gearmotor and all major pump components are molded from a tough, polycarbonate plastic to ensure cooler motor operation and make it resistant to corrosive chemicals. The RO-Minizertm Pure Water Maker line from Ion Exchange Products offers off-the-shelf units to produce drinking water from sea water. Available in sizes from 100 gpd to 100 tons (26,500 gallons) per day, the compact units are skid-mounted. The factory pre-tested reverse osmosis designs include modular pressure vessels containing spiral-wound cartridges of non-cellulosic membranes, triple plunger high-pressure pumps and all necessary instrumentation. The PAMTM thin-film reverse osmosis membranes are designed to provide long durability and increased chemical resistance, while the spiral-wound configuration is meant to resist colloidal fouling and aid in more effective cleaning measures. The SH Series of low-power consumption ultraviolet equipment from Matt-Son is appropriate for a broad range of private and municipal applications. With a 9,000 hour lamp life, the stainless steel models are designed for vertical or horizontal operation and feature a heavy-duty quartz jacket to protect the UV lamps and insure peak UV radiation to the liquid. The UV lamp and quartz sleeve can be removed from either side of the unit, allowing for easy access. Optional equipment includes a light sensor with audible alarm, narrow band UV meter, elapsed running time meter and flow control. A modular system design for Continuous Deionization (CDI) systems from Ionpure Technologies allows users to produce ultrapure water at flow rates of up to 500 gpm or more. CDI accomplishes ion exchange regeneration using electrical current to continuously drive retained ions off the resins. A consistent water quality level of up to 18 megohm-cm, with less than 5 ppb of silica, can be maintained. The O3-T, an ozone test kit from Longmark Ozone Industries, is designed for water bottlers and other professionals using ozone for microbiological control. 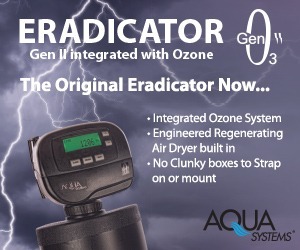 The 2-1/4″ x 4″ x 1″ unit utilizes the “indigo colorimetric” method according to ASTM Standard 4500-03-B to measure ozone residual up to .6 ppm in less than 30 seconds. The O3-T uses only one vial per test. The kit comes complete with 25 test vials and operates on a standard 9V battery. Also available are ozone generators and preassembled ozone systems with production rates up to one pound per day. Federal Process has added a new model to its line of machines that automatically apply TeflonTM tape. With a cycle time of 2.0 seconds, the new 7200 applies a double wrap of thick tape to fittings ranging in size from 1/8″ NPT to 3/4″ NPT. The thread tapers provide significant savings for OEM’s processing more than 50,000 fittings per year, according to the manufacturer. The PULSAtron SERIES C from Pulsafeeder is a line of single function electronic metering pumps. The water-resistant pumps with an internal sound dampening mechanism are UL listed for indoor and outdoor applications. Four models, each featuring a guided ball check valve system to reduce back flow, are available with pressure capabilities to 80 psig and flow capacities to 30 gpd. Metering performance is reproducible to within +/-3% of maximum capacity. The Series C pumps can be seen at the Long Beach WQA Show, Island F.
DIAS-AID from DIAS is designed to eliminate the problem of scale or “lime deposit” formation on the ice making surfaces of ice machines. The system consists of a DIAS “Accu-Pulse” dispenser and food-grade chemicals that bond with the hardness so that it can be flushed down the drain. The dispenser is electrically connected to operate when the ice machine operates, introducing small amounts of the treatment into the make-up water. The ice machine water conditioning material is FDA and USDA approved and meets food chemicals Codex specifications. ProMinent Fluid Controls offers a chlorine dioxide generation system that is equipped with a “fail-safe” shut down, offering an alternative to chlorination. The BelloZon® generator process produces no undesirable or hazardous reactions, according to the manufacturer. The standard capacity range of the BelloZon chlorine dioxide generator is from 30 to 5,000 grams of ClO2 per hour at a maximum back pressure of 142 psi. ProMinent also offers special designs for capacities up to several kilograms of ClO2 per hour. The WATERMATE combination bottled water/coffee machine from Newco has a one-, two- or three-station option provided by an interchangeable base. Features include a three-gallon water bottle and a hot water faucet. Other models: cold-filtered water machine, a portable cold-filtered water machine and a port-able ambient water machine, all on exhibit at the Long Beach WQA Show. All models are designed to fit alongside existing brewing equipment or to be used as independent water stations. 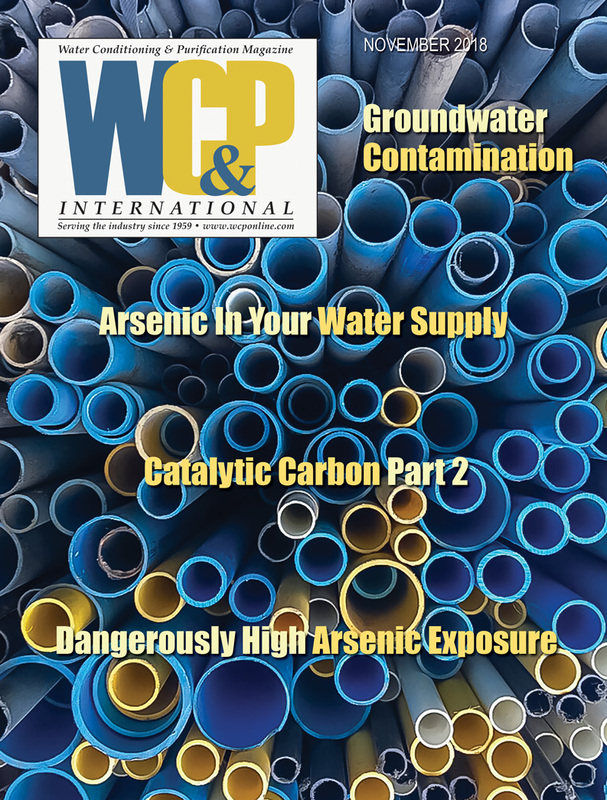 Three wastewater analysis kits from Sensidyne allow field measurement of chlorinated hydrocarbons using direct reading, length of stain detector tubes. level. Calibration charts convert the chlorinated hydrocarbon level of the air to corresponding concentrations in the wastewater. Kits are available for perchloroethylene (tetrachloroethylene), trichloroethylene and 1,1,1- trichloroethane (methyl chloroform). The Pure-Tek Water ProcessorTM from Water Systems Development uses deionization within a 10-stage filtering system to produce up to 20 gph. The countertop appliance contains a built-in sensor to monitor water quality. The filter processes up to 160 gallons of drinking water before filter exchange is required, as indicated by a multi-colored light display. 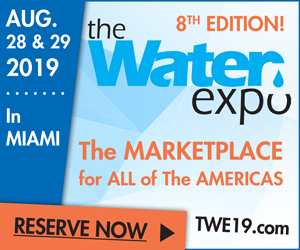 The countertop, self-serve coinless water vending machine from Imperial Water Products uses a triple filtration process with a 5-micron prefilter, extended by-pass carbon block filter of 1/2 micron and an ultraviolet phase. Optional reverse os-mosis and deionization are available. The system, with automatic shut-off and no drain requirement, is designed for use in supermarkets, convenience stores, resorts or health food stores. The Northfield 231-85 stainless steel ultraviolet light unit from Northfield Research carries a five-year warranty and one year on all UL-approved electric components. The 3″ x 5″ x 15″ unit, which can be mounted in any position, has 1/2″ NPT fittings and two stainless steel connecting hoses. It is self-cleaning by swirling water action in the UV chamber. The Series EST-NC valve from Plast-O-Matic is a two-way shut-off valve for sites involving high pressure requirements with highly corrosive or ultrapure liquid systems. A clear acrylic cylinder wall in the air chamber permits the operator to see the position of the valve piston and the user to check the condition of the operating chamber. The normally closed, air pressure to open, spring to return, shut-off valve will provide bubble tight shut-off against liquid line pressure up to 125 psi in the event of an air pressure failure. Other features: visual warning of a primary seal failure while permitting the valve to continue functioning; PVC body material; seals in Viton®, Buna-N or EPDM; and million-cycle Teflon® shaft design valves which can be provided with manual set limit-stops. A United Electric Controls pressure switch senses a delta-p build up and provides switch contact actuation on set point. Several versions are offered: weatherproof with terminal block and conduit connection, weatherproof with terminal block conduit and neon light, self contained with 9 volt battery and buzzer, and self contained with battery and LED light. To meet various media requirements, there is a choice between polysulphone and brass pressure connections. The switch provides settings from one to 45 psid, allows working pressures to 150 psi, and is rated for loads in the milliamps at 5VDC to 10 amps at 230 VAC. Typical set point repeatability is +/-1% of range. A non-contacting ultrasonic sensor allows the DFM-II Doppler Flow Meter from Greyline Instruments to measure the flow of most liquids from outside the pipe. The DFM-II is designed for liquids containing suspen-ded solids or air bubbles such as wastewater, pota-ble water or cooling water in steel, copper or plastic pipes over 1″ I.D. The instrument is housed in a watertight NEMA4X enclosure with a submersible sensor. Isolated 4-20mA output, lightning protection and a built-in calibrator are standard features. Options include dual-head sensors, extended sensor cable up to 500′, built-in chart recorder, data logger, totalizer and control relays. Fischer & Porter has added two chemical feed pumps, one solenoid driven and one motor driven, to its disinfection equipment product line. The pumps are designed to pump sodium hypochlorite into a liquid line at controlled rates in both manual and automatic control modes. The solenoid-driven pump has a capacity of 190 gallons per day (gpd) in systems with maximum pressures of 30 to 140 psi, depending on pump capacity. The capacity of the motor-driven pump ranges to 1,920 gpd in systems with maximum pressures of 125 to 1,100 psi, depending on pump capacity and materials of construction for the liquid end.